Park Forest, IL–(ENEWSPF)– The Village of Park Forest has canceled its 4th of July Parade, according to Community Policing Officer La Tara Chaney. A chilled rain has been falling for most of the day in Park Forest, light at times, but never stopping. Weather forecasts call for rain to continue throughout the afternoon, possibly developing into thunder storms tonight. Concerts and other activities at Central Park have also been canceled. 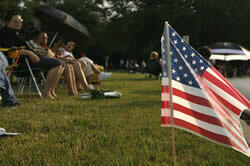 Fireworks are scheduled to go off Sunday, July 5, at dusk, from Central Park. Officer Chaney said there are no plans to reschedule the parade.